I just posted my year end video featuring my favorite images of 2012 (shown in chronological order). I hope that you all enjoy it, and I hope you have a great 2013! December is a really busy month for us photographers, since so many of our clients reach out to us for their annual holiday photos. 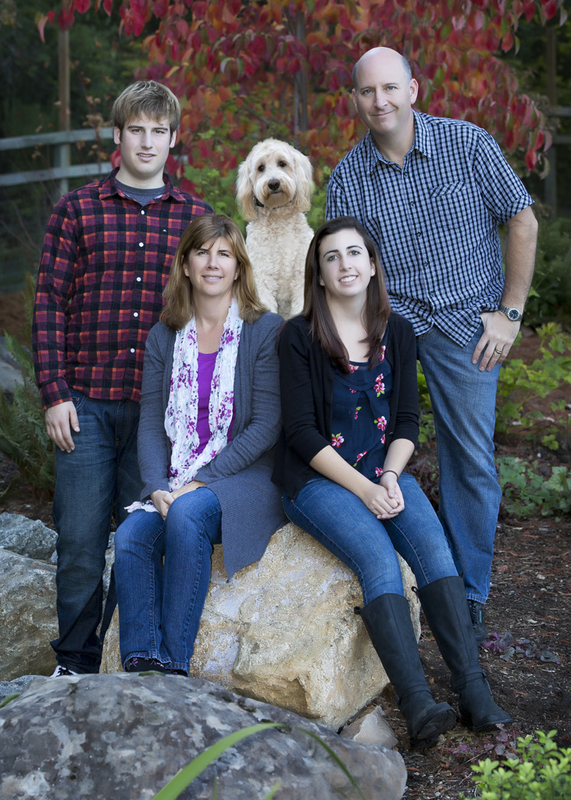 I try my hardest to capture family portraits for any of our friends or family who request them. 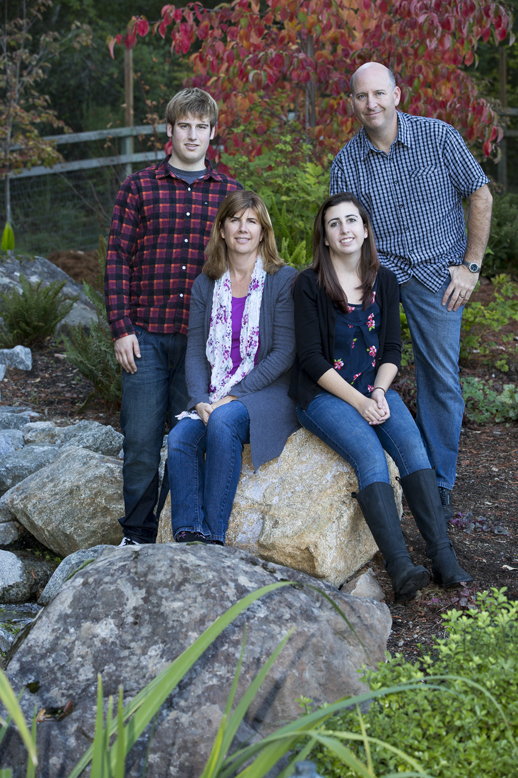 I also end up editing a whole lot of family photos from this past year's events, as the requests come piling in. With all of this happening, it is sometimes difficult for me to capture my own family portrait. There are times in the past, when we have sent out a photo of our kids (which is much easier for me to shoot), but it is always nice to have the whole family if possible. So...this year, on Thanksgiving Day, while spending an hour capturing family photos for extended family members, I set up my camera and asked one of our relatives to shoot our family portrait. He did a great job of holding the camera steady, and his framing was pretty good, but after seeing the images, I was a little unhappy with the gaping hole in the middle of our group. If I had been shooting the image, I would probably have asked my son and I to move a little closer to each other, but I was not shooting and couldn't tell until later in the evening and it was too late to re-shoot. A week went by and I decided to play with the image a little more, and then it hit me! 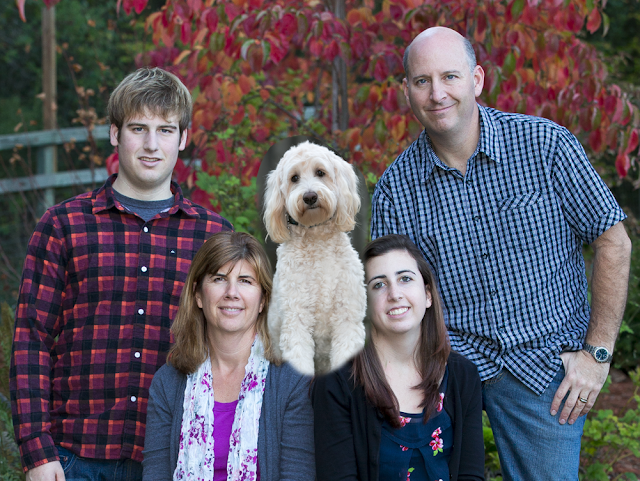 Our new puppy, Cooper, was not with us on Thanksgiving and needed to be added to the image. And that hole in the middle would be a perfect place for him. So I decided to take an OK image and make it better. This is the original RAW file. The first thing I needed to do was to make adjustments to the exposure and contrast. Step one: Using Adobe Camera RAW, I brightened the image by half a stop and added a little contrast. 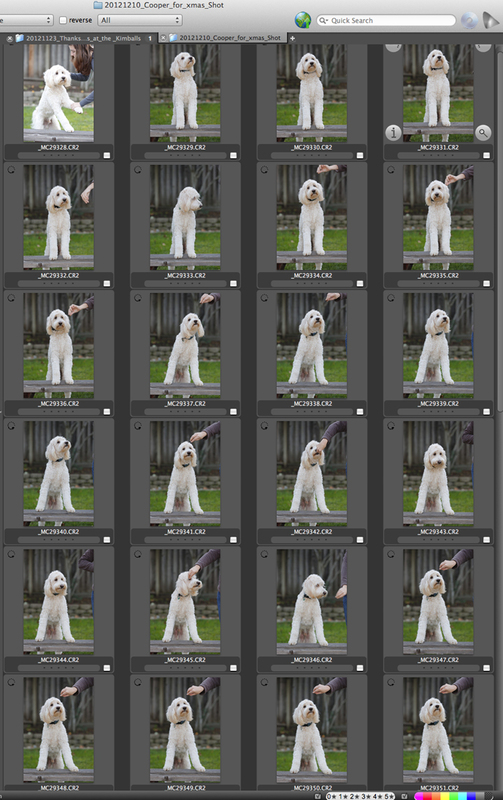 Step 2: I needed to shoot photos of Cooper to drop into our family photo. Trying to keep the lighting the same, I took Cooper outside in my backyard to use natural light and a little fill flash (just like we did on Thanksgiving Day). 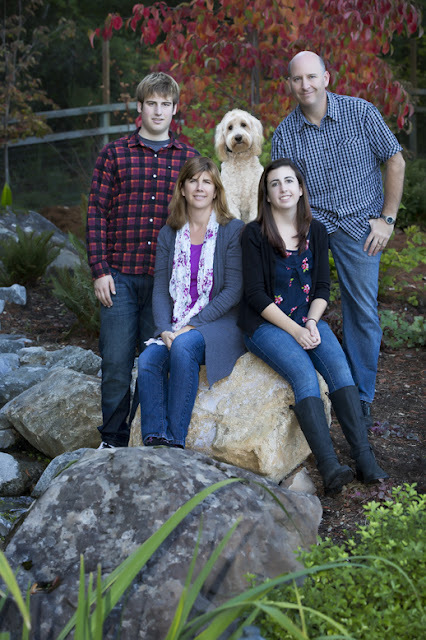 I knew that I needed Coopers front paws to be raised so that it would look natural behind my wife and daughter. I put a wood bench in front of him and my wife kept his attention with some treats. As you can see, I shot plenty of frames to try and get him looking at the camera and with that perfect expression on his face. Step 3: I found the photo of Cooper that looked best, and, using the lasso tool in Adobe Photoshop CS6, did a rough outline around him and copied that part of the image. 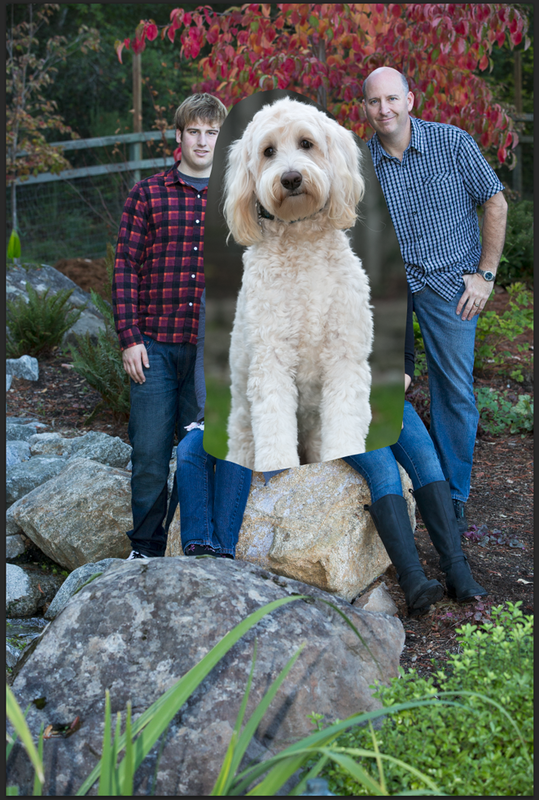 Step 4: I pasted the image of Cooper into a new layer onto our family photo. 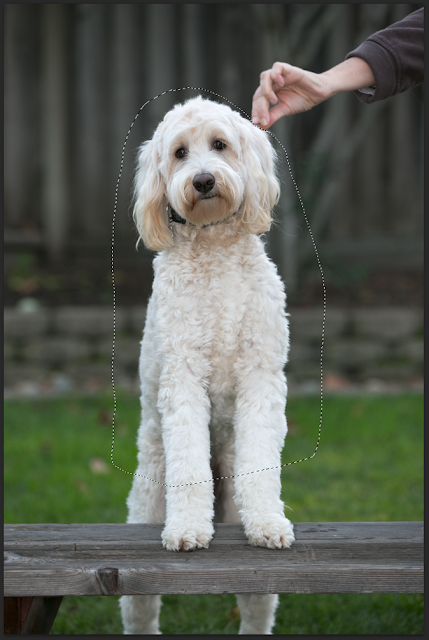 Step 5: Using the Transform feature, I re-sized the layer so that Cooper would not be "Clifford the Big Red Dog" huge. The size is much better now, but you can see that I still have a ways to go. Step 6: I create a Layer Mask for Cooper's layer and paint out the background surrounding the dog and make sure that my wife and daughter are not covered by any of Cooper. This is what the image looked like with Cooper in place, but the image is not complete yet. There were a couple of small distractions in the photo (garden hose, stray leaves, shadows...) that I removed. Step 8: For the final step, I cropped the image to a 5x7 aspect ration to drop into our holiday card. And there you have it. A fairly simple way for you to add your pet into your family portrait. Actually, I think this is probably easier than trying to take the same photo with all five of us. Cooper is still a puppy and not all that obedient or calm. I am not sure that he would have stood still for this shot, and I can almost guarantee that the four of us would not have been as calm if he was in the middle of us all. 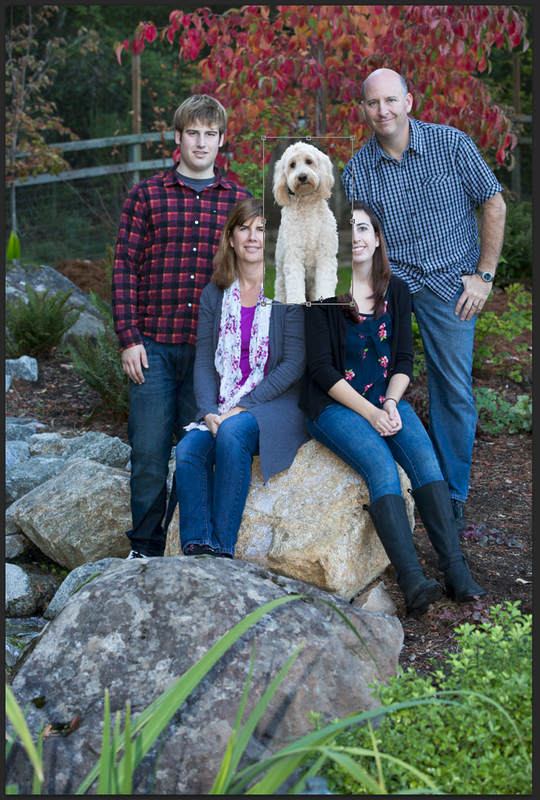 I hope that this helps all of you aspiring photographers to make a better family portrait in the future. You might recall that, about one month ago, I wrote a blog about my trip to Minneapolis. In that blog, entry I concentrated on the many reflections that I saw around the city. On that same trip, I also made a quick trip out to the Weisman Art Museum at the University of Minnesota. When researching interesting things to photograph in Minneapolis, I saw this interesting building which was across the river from my hotel. Amazingly, when asking people for directions to this museum, not one person knew what I was talking about. Thanks to my iPhone (yes - using Apple's Maps app), I was able to find the place and take some photos of this unique structure. I am not a huge modern art fan, but I was really captivated by this architecture. What was most intriguing to me was that, with even the smallest movement to one side or another, the photos of the building would take on a completely different look. I mostly shot wide images of the museum, but also tried to key in on certain areas of the building. For all of these shots, I used the Canon 5D Mark III with the 24-105mm lens. Since it was fairly overcast at the time, I set the camera to ISO 400 to keep my shutter speed fairly fast. For this shot, I moved farther to the left, and closer to the building. This allowed me to capture the name of the museum in the frame and also let me tilt the camera up to include the cloudy sky. Notice how this view of the museum shows only one window, whereas in the frames above (taken only feet away) show numerous windows. Just before leaving this location, the clouds dissipated just enough for the blue sky to peek through. This time, shooting from the right side of the building, I was able to show yet another perspective and get some color in the skies above. I have been to Minneapolis many times, but had never heard about the Mill Ruins. A friend told me that this would be a cool place to shoot images, so I drove back over the Mississippi river and headed to Mill Ruins Park. The Mill Ruins Park is located on the west bank of the Mississippi River and is a newly renovated park area. Walking around, you can see what is left from the 19th century flour mills. I had no idea that this area was once one of the worldwide leading producers of flour. You can see the Guthrie Theater in the background, with the cantilevered "Endless Bridge" which juts out from the theater. Here is another view of Mill Ruins district, with the ruins in the foreground and newly revitalized office and living space in the background. Canon 5D Mark III Silent Mode: Why doesn't Canon promote this more? When I saw that all of these had been addressed with the 5D Mark III, I ordered one camera to evaluate. As it turned out, I really liked the new features of the camera and the improved user interface. All was good. And then, after reading the manual and playing around a little more, I stumbled on the silent shooting mode. "Huh? What the heck is this?" I thought. And so I gave it a try. Oh my goodness, this feature is amazing! Some people may not care about a silent mode, but since I spend a lot of time shooting inside temples and churches, in an environment where the sound of a camera shutter is distracting, this is HUGE. Seriously, this feature is a real game changer for me! I can not tell you how many times I have shot images of a religious service and had the clergy look back at me with that disapproving look. Well...that does not happen any more. Some DSLR cameras have silent modes that frankly aren't that silent. Heck, even the Canon 1DX supposedly has a silent mode, but it sounds like a machine gun compared to the 5D Mark III. I actually tried using the 1DX inside a temple a couple of weeks ago and that did not go well. After only shooting 4 images, I got that "look of death" from the Rabbi. Hmmmmm... I won't do that again. In my area, there are numerous venues where they allow video capturing but not still photography. Sometimes they will give me a good reason for this rule, but other times, they just say "that's the rule" with no further explanation. With the silent mode of the 5D Mark III, I can ask for permission to shoot in "video mode" and fire off stills without disrupting anyone. As I said , this is a game changer! 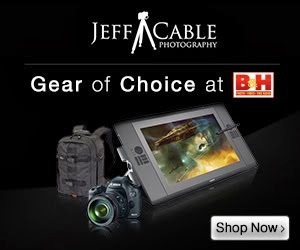 I can now shoot images in venues where many of my competitors can't. This is not only an amazing feature for people shooting weddings, bar mitzvahs, quinceaneras, or other quiet events. This would be perfect for those wildlife photographers who want to shoot photos of a skittish animal. Or better yet, how about those photographers trying to take pictures of a Tiger? Tiger Woods that is. He is always complaining about the photographers taking photos of him when he is about to hit a golf ball. Sure, the burst rate of the camera goes down from 7 frames a second to 3.5, but in most cases, this is still a good trade off. With all of this said, I should mention that when I am not shooting in a quiet environment, I still prefer to shoot in normal continuous mode. Why? Because I really like to hear the shutter in action. I have been shooting long enough that I can judge my shutter speed by the sound of the shutter. So anyways...my big question to Canon is: "Why aren't you guys promoting this feature more in your marketing materials?" This particular feature is a unique selling proposition against their competitors. Now, when people ask me my opinion on the 5D Mark III, this is my first comment. Yep, even more so than the clean shooting at ISO 3200. I am curious to know if other 5D Mark III users have had similar experiences. All I know is, I am silently happy as can be! Shhhhhhhhhhh.